Is desire for railway station sliding into ‘snake oil salesman’ territory? A meeting of Falkirk Council’s executive committee almost went off the rails last week. 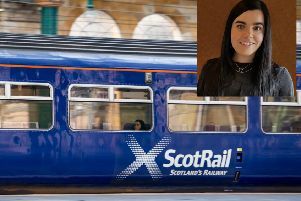 Feelings were running high last Tuesday afternoon when members discussed a motion from Councillor Linda Gow to obtain costs on a STAG (Scottish Transport Appraisal Guidance) report for a railway station in Bonnybridge. Councillor Gow also wanted the council leader to write to the Scottish Government to see if they would be in favour of bringing a railway station back to the village if a full STAG report found there was a good case for one. The motion followed on from a campaign by community group Reinstate Bonnybridge Railway Station. Councillor Tom Coleman said the issue of Bonnybridge rail station, which has come up at council on and off for almost a decade, being brought up in this manner at this particular time was “potentially straying into territory inhabited by snake oil salesman” and called Councillor Gow’s motion “almost pointless”. He put forward an amendment calling for the council to spend £42,000 from its reserves to pay for a pre-appraisal and stage one STAG report. Council leader Craig Martin criticised Councillor Coleman for inferring there was a comparison between Councillor Gow and a snake oil salesman, which is defined as “someone who knowingly sells fraudulent goods or who is themselves a fraud, quack, or charlatan”. Councillor David Alexander, who backed his SNP colleague’s amendment, said: “What this amendment does is move things ahead considerably more than the motion. It’s very strange this comes up a few months before the local elections. Councillor Gow responded to the “snake oil salesman” comment and defended the content of her motion. She said: “I have not strayed into the realms of a snake oil salesman, but I’m getting quite used to being insulted by the opposition. I don’t know how Councillor Coleman has come up with a figure of £42,000 when Stirling tells us they could not get a STAG report for under £80,000. The Scottish Government is currently developing its High Level Output Specification for the country’s railways and this includes investment to reduce journey times and allow more trains to run between Scotland’s main cities. Her Labour colleagues backed her motion, stating it was the right way to go about things. Councillor Adrian Mahoney said a letter the council received from then Scottish transport minister Stewart Stevenson in October 2010 stated the Scottish government did not support the creation of a rail station in Bonnybridge, so it would be wise to see if this was still the case. Councillor Dr Craig R Martin added: “We all want to see this happen, but the delays have happened because of national improvements to our railway structure. Why don’t we get the costings first and then find the money and go and do it. Councillor Coleman’s amendment was defeated by five votes to three. Committee convener Councillor Martin said he was disappointed by the SNP display at the meeting and continued Councillor Coleman’s Old Wild West “snake oil salesman” train of thought by stating the SNP councillor was gambling with the future. Councillor Robert Spears tried to put forward a further amendment to call for a STAG report for a railway station in Grangemouth, saying this could pave the way for a potential station at Falkirk Stadium or the Helix. His amendment was ruled incompetent by the council leader. The long running pursuit of a railway station for Bonnybridge built up a head of steam a year ago when members of Bonnybridge Heritage Group handed in a petition with over 1000 signatures to Falkirk Council. At the time Baillie Billy Buchanan, who has fought to bring a station to his Bonnybridge ward, said: “Bonnybridge at one time had four railway stations, the first was opened in 1842 at High Bonnybridge and was the last to close in 1967. “Since this time over the years Bonnybridge has increased its population, due to the housing boom of a few years ago, and is now home to 7000 people.